Dr. Alka Deo Marulkar (born 4th December, 1951) is a versatile vocalist, and a thinking musician. 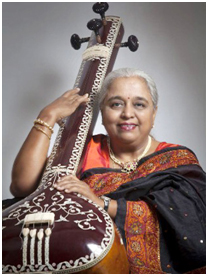 She has been awarded the Sangeetacharya degree – Doctorate in Music. She has had many accolades to her credit for her outstanding work, both in the field of musicology and her performing career. Alkatai‘s tutelage in music began at the tender age of 4, under her father, the veteran Rajabhau alias Dhundiraj Deo of the Gwalior, Kirana and Jaipur gharanas. Her training with her father continued for more than 35 years which enabled her to visualize a raga with various perspectives. She further went on to seek taleem from Madhusudan Kanetkar, another stalwart of the gharana, which continued for almost 10 years. Her gayaki consists of solidity of Gwalior, romanticism of Kirana and intellectuality of Jaipur gharanas, with an added flavour of subtle rhythmic approach, towards her presentation. Her command over semi-classical forms like Thumri, Dadra, Kajri, Chaiti, and Hori in the Banaras style shows her versatility. She has been honoured with the titles ‘Sangeet Shiromani’, ‘Sangeet Kaumudi’ by the Trinity Club Mumbai, and ‘Gaana Saraswati’ by the Pracheen Kala Kendra Chandigarh. She has been conferred with the Dr. Prabha Atre Puraskar. She has received the young artist scholarship by the Dept. of Culture, New Delhi, and the Rajasthan Sangeet Natak Akademi talent scholarship. Raaga That – Bandish Bhav (Mukta Sangeet Samvad), Premanjali (Swarangan), Maza Swar- Shabda Shodh ( Sahitya Suchi), Sangeet prashikshan-ek prakat chintan (Rashtra Mat, Goa), Sur Sangat – a series of 18 articles on the personality and gayaki of the prominent classical musicians of India. She has recorded for AIR, Vividh Bharati, Doordarshan and has performed in various Akashvani Sangeet Sammelans. Being an elite artiste, Alkatai has performed in front of connoisseurs in various programmes in India and abroad. Alka Deo-Marulkar has been recognized for her outstanding lecture-demonstrations because of her notable works in the Vasant Vyakhyan Mala, Musiquest, Gaanvardhan lecture series, Sawai Gandharva Samiti Shikshan Mandal, etc. She has penned numerous bandishes under the pen name ‘Rasaranga’. She has also created new ragas like Jogeshree, Varadashree, Madhyamaadi Gurjari, Anand Kalyan. She has worked as a Guru in the Lalit Kala Kendra, University of Pune for 12 years, and has also worked as the director of Faculty of Indian Music and Dance, Kala Academy, Goa, from 2002 to 2007.